Eldritch Moon is a transformative set for Magic: The Gathering, and if you’ve ever enjoyed the game at any time this is the set to really double down on. It’s a remarkably fun set of cards to play with, play limited formats with, or augment pre-existing decks with, and it all comes down to some remarkable design and development by Ken Nagle, Sam Stoddard and their respective teams. There’s a couple key reasons why this set is so excellent, and I want to drill down into some of the narrative concepts, mechanics and interactions that I have found to be so delightful in this set. 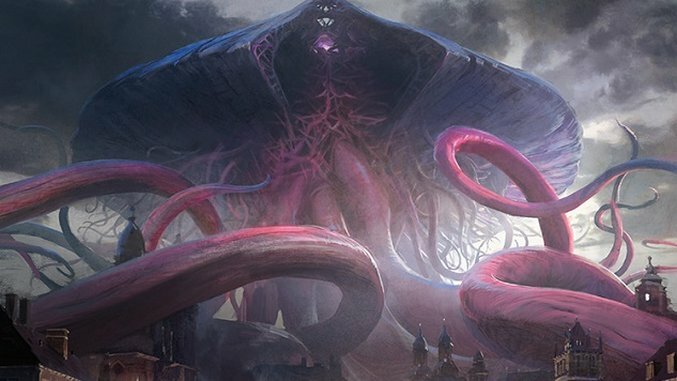 The narrative core of Eldritch Moon is that Emrakul, an Eldrazi titan (think unthinkable Lovecraftian monstrosity), has traveled to the zombie-infested, vampire-ridden, werewolf-having world of Innistrad. Emrakul is, first and foremost, an agent that warps life into her own image. Therefore, many people and creatures on Innistrad have taken on the tentacled visage of Emrakul, and they’ve taken to bursting out of bodies like the namesake of Alien. Mechanically, this is called “emerge,” and it is delightful—you can cast a creature with emerge by sacrificing another creature and reducing the emerging creature’s mana cost by that creature’s amount. My favorite is probably Wretched Gryff, a horror that bursts forth from Boon Gryff to draw you a card. Delirium, a mechanic that changes how a card works based on what cards you have in the graveyard, and madness, a mechanic that allows you to cast cards when you discard them, both return from Shadows Over Innistrad. They both fit beautifully within a world that is devolving into the complete chaos of corrupted nature, religious fervor and apocalyptic trauma. From a narrative perspective, the set tells a simple story. Shadows Over Innistrad showed the planeswalker Sorin Markov coming to terms with many kinds of chickens who returned to roost: his creation Avacyn was driven mad by the influence of his former protégé who he abandoned. He was forced to kill the former, and by the end of Eldritch Moon’s plot the latter has trapped Sorin in stone while the summoned Emrakul destroys his entire world. The story of the Gatewatch, the protectors of Zendikar and beyond, has continued here in response to the Emrakul crisis. Liliana, the planeswalker powered by black mana, finally joined the team. With help from another planeswalker, the Gatewatch trapped Emrakul in the moon. It was a wild ride for everyone. These narrative threads have made for some amazing different cards. Emrakul’s warping of the world has created opportunities for evolution. Liliana’s summoning of the zombie hordes has enabled a certain Dark Salvation to take place. Beyond the zombies or the werewolves, there is also the brute fact that the Gatewatch needs to be deployed in order to deal with the violent hordes of warped beings. The tightness with which this set has managed to knit together its mechanics and story is basically the apex of the last few years of Magic’s narrative design trends, and I cannot wait to see Kaladesh very soon. I’ve spent quite a bit of time recently thinking about the scale and time of Magic. It’s a game that has gone through so many different forms, modes of storytelling, and ways of creating the game, but it somehow always manages to cohere together. For the popular internet discourse about the game, it seems that lots of sets seem to fade in the background while individual cards get remembered forever. Eldritch Moon has the feeling of a unit, a compact thing, and I hope it ends up being remembered that way. I hope we remember these cards, their interactions, and this story for a while.